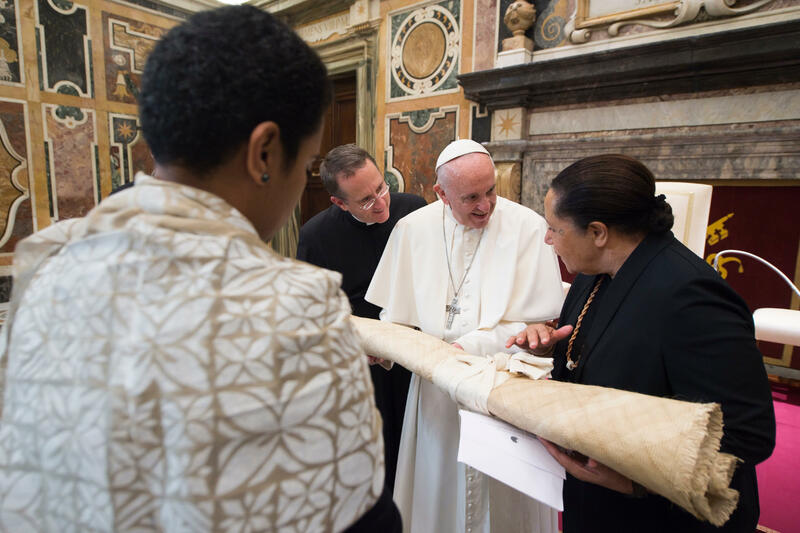 The Holy Father’s comments came in the Clementine Hall of the Apostolic Palace, where he received in audience the leaders of the “Pacific Islands Forum Secretariat” from the eleven island states: Australia, the Cook Islands, the Federated States of Micronesia, French Polynesia, Kiribati, Nauru, New Zealand, Papua New Guinea, the Republic of the Marshall Islands, Samoa and Vanuatu. The leaders met in Rome in recent days in a high-level summit on the problems faced by countries in the Pacific Ocean area and today will participate in a round table at the Food and Agriculture Organization (FAO) in Rome, to discuss food security in the region, nutrition, climate change, disaster risk reduction and resilient means of subsistence. The leaders will then proceed to Bonn where they will attend the United Nations Climate Change Conference COP23. You have come here from countries far distant from Rome, yet that vision of an “earth without borders” dissolves all geographic distances. It reminds us of the need for a global outlook, international cooperation and solidarity, and a shared strategy, which can prevent us from remaining indifferent in the face of grave problems such as the deterioration of the environment and of the health of the oceans, which is itself linked to the human and social deterioration experienced by humanity today. Not only geographic and territorial distances, but also distances in time are dissolved by the realization that everything in the world is intimately connected (cf. ibid., 16). Almost thirty years have passed since the Filipino Bishops’ appeal, and yet it cannot be said that the situation of the oceans and marine ecosystem has really improved. We still face any number of problems regarding, for example, the management of fishing resources, activities in shallow and deep waters, the situation of coastal communities and of fishing families, and the pollution caused by the accumulation of plastics and micro-plastics. “What kind of world do we want to leave to those who come after us, to children who are now growing up? This question not only concerns the environment in isolation… When we ask ourselves what kind of world we want to leave behind, we think in the first place of its general direction, its meaning and its values” (ibid., 160). I thank you for your welcome visit and I invoke upon you and your countries God’s abundant blessings.